On this picture is the main gate of the legendary refugee camp in Traiskirchen, Austria near its capital Vienna. I spent there nine months from September 9th, 1984 until June 15th, 1985. The refugee camp was converted from military barracks formerly occupied by the Soviet Red Army, which left in 1955. 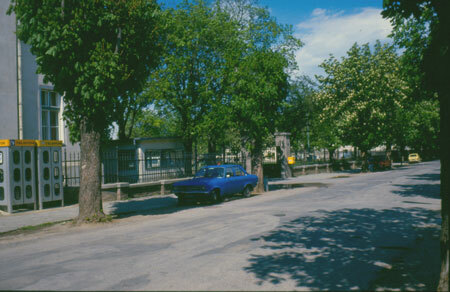 The compound started serving its purpose especially since the Hungarian uprising against the Soviet communist rule in 1956 resulting in the flood of 200 thousands of Hungarian refugees into Austria. Around the corner from the main gate of the refugee camp in Traiskirchen. The camp served as a transition point for the most of the refugees coming into Austria and I was no exception. On the day when I arrived on September 9th in 1984 me and my friend were taken into about one week long custody on the forth floor of the main building called "Isolation Quarters". During that one week in "Isolation" we were subjected to not too friendly interrogation by an Austrian interrogator Josef Holoubek, who spoke broken Czech with strong German accent and supposedly there is an evidence that he was also paid by the Czech state police (an actual branch of infamous Soviet secret service - KGB) to spy on us, the escapees from communism. It wouldn't be too surprising, the refugee camp was swarming with informants from all sides on the Cold War battle lines. This is the view from the main yard towards the quarters that belonged to the Czech refugees and where I spent almost my whole time in Austria. The middle two windows on the top floor was the room that I shared with at least half a dozen of my compatriots. After the one week we spent in "Isolation" we were issued special ID's and were released into the general population of the refugee camp. Since it was fall, we received warm blankets and some basic clothing including warm jackets to take us through not very pleasant winter. 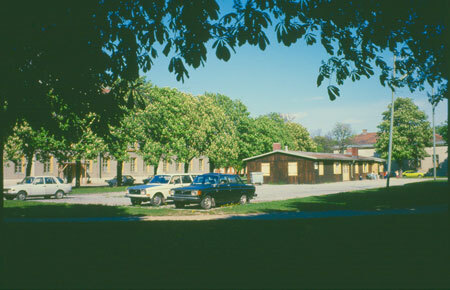 The refugee camp in Traiskirchen housed refugees with single status; the families usually were transported to private owned hotels all over Austria. 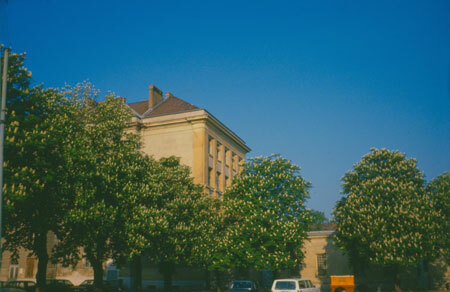 This is picture taken in the main yard away from the main building on the picture above towards the administration building in the background. The wooden building up front belonged to YMCA. 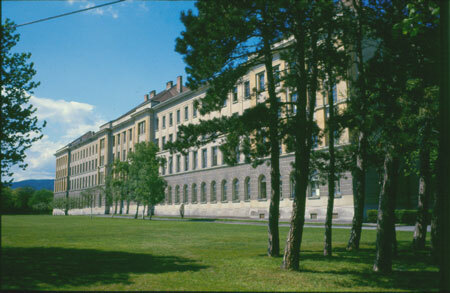 The administration building housed the humanitarian non-governmental organizations that were helping the political refugees to settle in the West. The organizations included for example a Catholic charity Charitas and many others; me and my friend registered with American Fund for Czechoslovak Refugees (AFCR), which was founded shortly after the communist takeover of Czechoslovakia in 1948 by then its ambassador Ján Papánek. The AFCR helped us to fill the US Immigration documents and arranged the interview with the US Consul in Vienna.